Title: Why Didn’t They Tell Me? Get your head out from under the duvet, switch off the doom and gloom TV, and don’t even think about battening down the hatches or heading for the hills. Because if you do, you’ll miss out on a huge opportunity – just like millions of ‘sheep’ blindly doing what everyone else is doing. Watch TV or read the mainstream media, you’d be forgiven for thinking that economic Armageddon is about to descend upon all of us…that all resistance is futile. Some of the biggest financial fortunes in history have their roots in recession. Why? Because for every problem an economic downturn creates, an opportunity opens up. One mans distress sale is another mans bargain buy. People don’t stop spending money…they just spend a little less in slightly different ways. They spend more on some stuff too! And they’re persuaded by different promotional appeals than when the good times are rolling. Adapt to that…and adaptation is the key…and a bonanza awaits. With the scared sheep safely out of the way, it’s open season for those of us who don’t follow the herd (or should that be flock?) to steam in and start making money. has come at just the right time. The book is an unashamed second volume of the highly acclaimed (if I say so myself) ‘The Money Making Magic Of A Funfair Goldfish And Other Get Rich Secrets Of A Mattress-Bound Millionaire’, and follows a similar format. That means short, easily digested chapters, many of which were originally designed and used as ‘insider’ training materials for a small group of people I’ve been individually mentoring to greater success. A business associate who read ‘The Money Making Magic Of A Funfair Goldfish’ said he liked it because you could read a chapter and get an idea to act on while sat on the toilet. That wasn’t exactly what he said, but I’ve edited his comments out of concern to the sensitivities of more genteel readers! Whilst I thought this said more about the state of his digestive system than the nature of the book, I knew what he meant. 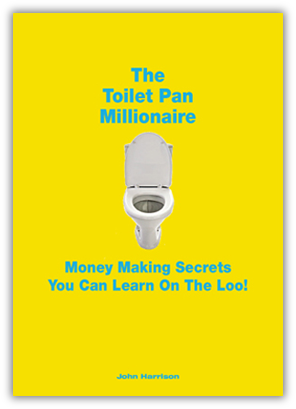 And so ‘The Toilet Pan Millionaire – Money Making Secrets You can Learn On The Loo!’ was born. It follows a similar pattern to its predecessor, and will maybe even appeal to those with a little more fibre in their diet – if you get my drift! Over 300 pages…more than 90 chapters…each containing an idea you can take away and use to enhance your wealth and success straight away. I’ve just remembered after reading these comments something I should have told you earlier. This isn’t some dry and boring business book…full of sound information but dull as ditch water. As you’ll see, people really seem to enjoy reading it – and I think that’s important. I want you to learn something (and more importantly, act on what you’ve learned) but I want you to have a good time learning it too. How to get rich in a recession. I’ve done it before. Here’s how to do it again! Many major fortunes have their roots in difficult times. Now’s your chance. The secret of the world’s most successful author (bet you can’t guess who it is!) and how you can use it to make a fortune in any business. I’ve personally made millions from this one idea. Why ‘bad publicity’ is often the very best kind…and how to create it without ruining your reputation. What embarrassing bodies on TV taught me about overcoming the biggest single barrier to making a profit-yielding sale. Sometimes the best ideas come from the strangest places! The profit inducing secret I learned from my rowing machine and a Marks & Spencer sandwich. If you’re not using this you’re missing a massive opportunity. The truth about the ‘worlds worst business’ where 99% of prospects tell you to “*** off”…but makes millionaires from paupers! Why you need customers to hate you…and if they don’t you’re in trouble. How to legally imprison a customer, and refuse to let him leave with his wallet. The truth about luck I learned from Paul Daniels…and how to attract all the luck you’ll ever need. The great pie secret. Every entrepreneur needs to know about pies, but most don’t have a clue. What a pro wrestler taught me about marketing to real people. This will force you to see new and exciting opportunities in any bog standard product. The secret ingredient that almost forces and compels your customers to find out more about you and your products. Anyone can use this but it’s rarely, if ever, talked about. It beats talking about ‘benefits’ by a mile. Why Paul McCartney, Burt Bacharach and David Bowie should make you rejoice (and excited) that you haven’t got started in your new business yet. What they have in common isn’t a secret, but nobody seems to have noticed it! Why saving money is for morons…and there are an awful lot of them about! The destructive subliminal message in film, TV and media which you must be consciously aware of if it’s not to cruelly sabotage your efforts to get rich. How to determine your real age. The answer will almost certainly stun you, and give you a new lease on life. The hidden danger in a good education…and what to do to protect yourself from harm. How being hard to please could make you rich. The Simon Cowell secret, and how you can use it to transform your fortunes. How to boost your profits by turning away customers. It’s counter-intuitive, but it works! The one question people want answering above all others. It won’t come as a shock, but what it means for you almost certainly will. What Jack Lemmon said about elevators. There are million pound fortunes ready to spring from his words, and yours could be one of them. The three simple questions you need to ask yourself about any new venture. It will take less than a minute and the answers will reveal instantaneously whether you should proceed. The money making secret revealed by Karl Marx (of all people!) and how you can use it to turn a struggling business into a fortune maker. Apply this to any business and watch the cash pour in. How to speak to your customers in language they’ll understand – and have them reaching for their wallets. Most businesses do just the opposite. The Duke of Wellington test…How to tell if you’re cut out to be a successful entrepreneur. Why lottery winners are miserable…but why I still want to win. And you should too! What have the Okinawa Islanders and a Formula One car got in common? The answer reveals something incredibly powerful about wealth and success. The common thread that links Margaret Thatcher and Dennis Skinner…and why you need to be more like Tony Blair or David Cameron if you want to amass more cash than you can count. The secret I learned from a hearing aid salesman that you’d be crazy to ignore. Add 50% to your profits in weeks by using this. How to become a ‘method marketer’. It works for actors and it can work for you too. I had to get very uncomfortable to learn to use this, and you might too. How to uncover, rediscover and exploit your hidden skills and abilities. Don’t think you’ve got any? Prepare for a shock. Why getting a degree can be worse than useless…and how to ‘recover’ if you already have one. The character flaw shared by Al Capone and Heather Mills…and what it tells us about the one thing you must never say to a customer if you want them to buy from you. What Moby and me (but not together!) did to get rich. If you’re struggling to stand out you need to read about this now. Why ‘intelligent’ people wind up broke, and thickies’ often prosper. What Marie Antoinette knew about business that most entrepreneurs don’t. Ignore this and you face a world of pain and disappointment. Take it on board and it’s like someone just gave you an immediate upgrade to the fast track. Why you need to be greedy…but only at the right time. And it’s not when you think. Switch on your greed gland at the right moment and a fortune awaits. How to demolish the physical and psychological barriers that stop cash flooding from your customer’s bank account to yours. This works for any business dealing with the public. The counter-intuitive and shocking truth about giving customers choice. How to boost your profits by making your customers decisions for them. What I learned about success from a famous actor while I was letting him out of jail. (Really!) You’re going to have a massive ‘aha’ moment when you read about this. …You’re unlikely to get bored! Making Secrets You Can Learn On The Loo”…Today! To receive your copy of the book click the link at the bottom of the page or you can call our credit card hotlines on 01709 361819. You can order ‘The Toilet Pan Millionaire’ in complete confidence. If you’re unhappy with it for any reason whatsoever, or can’t see how you can put the insider information it contains to use, then you can simply return it within 30 days and receive a prompt and courteous refund of every penny you’ve paid. Is that fair? I desperately want to get this information out to as many people who need it as possible. That’s why I’m making this guarantee totally unequivocal and completely ‘catch-free’. I don’t want there to be a single reason why you don’t get to look at this. It’s totally unconditional. You can return the book for any reason, or no reason at all. So when you order a copy of the book on approval, it’s without any risk or obligation. If you decide it’s not for you, then you get to read it for free. A risk for me as the author? Maybe. But it’s a risk worth taking to get this into your hands, and don’t think you’ll even think about returning it once you get hold of a copy. Special Website Price £9.95 (Usually £29.95) Buy your copy now. Absolutely spot on and hilarious. I am now laughing, so you have made my day. Absolutely brilliant. A fantastic and truthful view of things as they are. This has really shaken me and hopefully I can get on and do something. Thanks for the sound advice. It made me realise that much to my shame, I have done exactly what you are describing in the past. I won’t be making the same mistakes in the future. Very funny. Absolutely spot on though. Cheered me up no end. Well done! Very Good! You’re a brave man though. I think you may get a bit of hate mail. But that’s life! I will be instilling a spirit of entrepreneurship and critical reasoning in my boys as they grow up and will keep a copy of this for them to read and think about when they get older. You have articulated very nicely what I have been trying to put across to me children for the last few years. I think I will allow them to read this for themselves. It makes me smile and has some great ideas. Bound to make me better at my day job. Should be required reading at school. A big thumbs up to you for this. Thanks for brightening up my Monday morning…a brilliant piece of writing. Love it!!! At last a man who thinks like I do. You have made me and saved me a fortune over the last 15 or whatever it is years now. …an elegant, modern parable from the book of John, which should become part of a new Business Bible. Inspired. Thanks for a great series of information and inspiration. Whenever I read, there’s always an aha! moment. Excellent, very perceptive and very funny. I like your writing style. There are so many things to read, but your style is refreshing and holds the attention. I am about to embark on a new career from home with one of your recommendations. I read you for the first time today and I am all consumed. Worth every penny,keep up the good writing.